The 1905 US Geological Survey trip to Alaska inspired Hayes with natural beauty and disgusted him with human folly. By the end of the trip, the generally mild, hard working young man from Oregon finds himself pushed too far by a shirker named Small under the protection of the trip’s leaders Martin and Maddren. 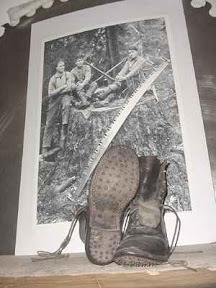 Hayes did not break his hand, and Small couldn’t see through swollen eyes to strike back with the axe he grabbed – but Hayes knows this will be his last USGS trip to Alaska. The map below won’t appear in an email. The current chapter appears as the green path down from Alaska, preceded by the blue up to Alaska, and followed by the short (funny) pink path around Northern Washington State. Click here to download chapters 1-30 on Google Earth. Hayes is up Canyon creek cooking for Hill and McDonald who are surveying around the nearby ranges. The rest of the survey team remains camped near Behring Lake. They’ve measured a 47 square mile coal area east of Copper River flats. If these rich fields are to be exploited, a deepwater port must be located; a coast and geodetic survey boat sounds Controller Bay while the survey team works. Hayes together with some in the survey party “have crossed the range to Behring Glacier, where there is a log cabin beside the ice field and where we can see away into infinity across the ice. It is the most majestic scene I have ever witnessed.” On days of unusual clarity long comet tails of windblown snow can be seen howling off Mounts St. Elias and Logan more than one hundred miles distant but looking more like ten. Martin is “chary” of christening the unnamed peaks nearby; he’s afraid “He might offend the powers that be in Washington if he did.” Already such luminaries as Foraker, Dall, and Tillman – all men in positions to give Martin his job – denominate peaks nearby. Maddren, the fossil collector, not so chary as Martin, names a small lake half a mile below their cabin Berg Lake. “Martin received his subordinate’s decision with shrieks of silence, and it was felt by all assembled here.” Martin’s reaction aside, the name seems apt. Every night gigantic bergs break off the glacier thundering into the lake sometimes roaring for minutes on end when successive bergs break from the main mass of ice. Now Hayes and several others are camped, “high above the gorge of Canyon Creek and at the timberline.” In early September this high up, winter approaches. 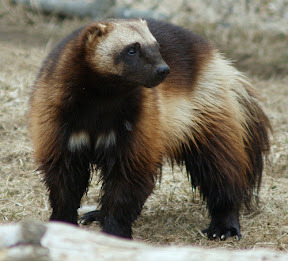 “Daily the snow line creeps down the big range to the north of us, and in a few days will be at the ice fields for the winter.” Returning up the hill from a hike to the main camp for supplies, Hayes saw that wolverine tracks covered his own downward footprints on the entire path. Hayes laughs at the engineers who all carry gold watches they love to show off to the impoverished miners. But when anyone wants to know the correct time, they all ask Hayes who owns a dollar Ingersoll whose timekeeping improved after falling to the floor where it was stepped on by some heavy Alaskan in hob-nailed boot. 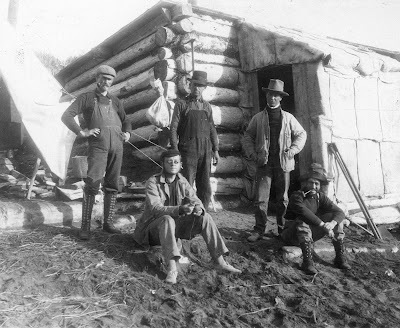 After a couple of days with Hayes doing all the “slop-up jobs” and Small recovering his sight, Martin, Maddren, and the two combatants rejoined the main party at Behring Lake. When the rest of the crew “proclaimed their joy at Small’s take down,” Martin finally realized he’d “backed the wrong horse.” One of the company, Billy Hill went so far as to quote scripture “Behold, he that seeketh earnestly shall find!” (Hayes’ quote.) All but the two bosses had seen Small’s bullying and are glad Hayes evened the score. With winter coming in earnest the entire crew waits at Wingham Island for the steamer Excelsior. At a stopover at Yakutat, one of the young survey members, Bill McDonald, “got a crush on an Indian maid named Judith Johnson.” Judith returned his affection and only the ship’s departure cut short a budding romance. “Sitka is as picturesque as ever.” As when he had been here before, Hayes is favorably impressed with the Indian school. The students from Ketchikan to Nome and Behring Strait, “seem an earnest lot, and surely some good will come out of this school.” Technical training and book work for the boys, domestic science for the girls. 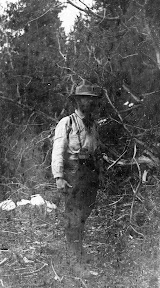 Immediately following his first survey trip to Alaska in 1903, Hayes: turned down a place at Stanford; learned of his father’s death; sailed fruitlessly to Liverpool and back to Galveston; walked across the Southwestern United States desert; broke rocks in Tacoma, and hopped logs for a winter in Eureka. He calls all that “My last disaster after leaving Alaska.” Fearing a repeat, he’s determined to save what he earned this past summer in Alaska. After missing the 1904 trip, Hayes catches on with Martin for the 1906 survey trip to Alaska. Hayes serves as boatman, cook, and general camp roustabout for a much larger party in 1906. The map below won’t appear in an email. The current chapter appears as the blue path up the Alaska coast, preceded by the pink from California, and followed by the green south back down the Alaska coast. Click here to download chapters 1-29 on Google Earth. The fossils in the nearby hills indicate a tropical climate reigned here at one time: Hayes found some magnolia leaves and Martin found palm fronds that will be sent back to Washington. Alfred H. Brooks, head of the Alaska Survey, “the big shot,” has joined Martin’s group and is pressing to explore the Katalla region as quickly as possible. At Katallah, Hayes pitched the party’s tent on “an old Indian shack … and we had a splendid floor made of hewn planks.” He remarks that he, Martin and Brooks “line well together”: Hayes and Martin tow the boat and Brooks steers. “There can be no deadheads in Alaska unless it be near the coast. Every tub must stand in a measure on its own bottom here.” According to Hayes, “Brooks has seen a good deal of the wilderness, but no man can understand very much about it unless he is constantly in it.” Hayes seems to include himself in this assessment as he says, “Therefore we have made a few blunders since wandering about the country.” At Stillwater Creek, which is only still where it enters the Behring River, a horse some coal company men hobbled to shoe, broke its rope, backed into the rushing river, and drown. 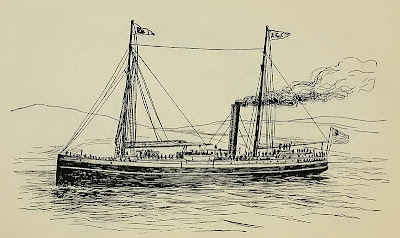 Brooks, Martin and Hayes came upon its corpse while lining up the Behring. Brooks, Martin and Hayes, seem to have formed a functioning trio. Hayes says the three of them went to the face of the Behring Glacier for a few days. 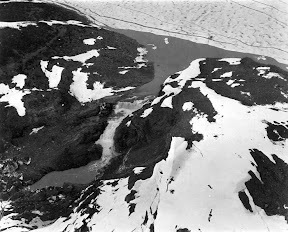 “I stayed with the goods on the flats near the ice fields while Brooks and Martin Looked over the coal prospects about Canyon Creek, which roars–yes, literally roars down a gorge and spreads over its boulder strewn bed into the Behring.” Hayes is twitchy the whole four days he’s camped on the flat; an old timer told him of tremendous floods that roar down the gorge when an ice dam bursts from lakes that form on the ice fields. The trio returned to the main camp shooting a river running full with blocks of ice. “The two geologists walked down the bank while I shot the rapids, the boat being too heavily laden to carry the lot of us safely when there are so many rocks sticking up in the bed of the stream.” Martin and Hayes rejoined the rest of the survey team near Behring Lake while Brooks returned to Washington glad to be free of the mosquitoes. A full paragraph describing the number, tenacity, and means of battling “these voracious insects” ensues. “We get little news here in the wilderness. … The wildlife interests me more than the people.” The glaciers shut out deer, moose and caribou from this region, but the area is thick with bears: brown bears, similar to the giants on Kodiak Island; black bears smaller than the browns; and occasionally, out on the ice, a blue bear, said to be more savage than all the rest. Porcupines eat the tender bark of spruce trees and are eaten by hungry miners but “they are rather gamey to an unaccustomed tongue.” Marmots, resembling large prairie dogs, whistle sharply when surprised. 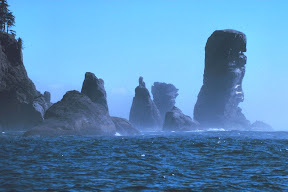 And Martin reports seeing sea otters off Cape Elias on the southern tip of Kayak Island. While none of this austere natural beauty quite adds up to happiness or contentment for Hayes, he certainly expresses awe. 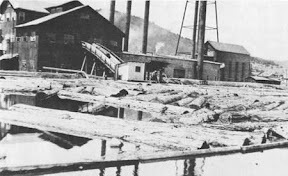 Entries in Hayes’ diary become sparse when he is “settled.” In this chapter Hayes spent a year in two places: breaking rocks at a quarry in Tacoma Washington, and running logs at a mill pond in Eureka California. Hayes writes in his diary only about once a month as he finds the settled life “dull, dull DULL.” To this reader who grew up in Oregon and has seen those great rafts of logs bobbing in the sloughs, skipping logs in the dark would seem anything but dull. Jean, Hayes mentions a cousin Edith Carlson in Marshfield Oregon. The map below won’t appear in an email. The current chapter appears as the pink path, preceded by the yellow from California, and followed by the blue north back to Alaska. Click here to download chapters 1-28 on Google Earth. Only Hayes, Old Jack “who has had his day,” and Pete the big Swede, “too cautious and too penurious to spend,” remain at the quarry looking out across the valley to the countryside, “charming in its summer beauty.” It’s good to have a rest day from the heavy work. Hayes figures he’ll stay on another month then head back to Eureka. As Price predicted, “Some of the men never returned from their celebration of the nation’s birthday.” But Tiddley came back – and suddenly he’s stopped complaining about the cook, “a sturdy Finnish widow, who always boils the eggs hard and makes the coffee strong.” Romance is in the air – so accordingly the men are sending Tiddley “quotations on baby carriages, bedroom sets and such.” But Tiddley has a rival, a twenty year old lad from Mississippi, “who learned to admire the widow.” The younger man comes in for chafing about being adopted by the widow “who is not an hour less than forty.” Hayes reports it all rather distractedly, laughing at the cook’s two nightly auxiliary dishwashers. We never find out who prevailed. Self-assessment over – back to work. Running logs on the pond requires a great deal of skill and Hayes is good at it. The local duck hunters are in a squabble because a number of wealthy “sportsmen” (Hayes’ quote) have incorporated the common ground into a private reserve, excluding “all the men who have hunted these grounds ever since they were able to carry a gun.” But Hayes has no gun, no desire to shoot ducks, and is tired after a day running logs anyway, so he stays out of the quarrel. Another month slips by with nothing to write about but the work. The redwood trees sent by the cutting outfit are magnificent. “We had one tree 27 (twenty-seven) feet in diameter formerly. It was hollow and had been burned out until a waterboy mounted on a pony rode his mount in eighty feet, then turned and came back out again.” By the time it was blasted to pieces, 35 logs were sawn from that single tree. The cutters up in the woods ship logs to the millpond by rail. Before a load is tipped into the water, Hayes and the other men on the pond amuse themselves predicting which on the load will be “sinkers,” butts of the tree so impregnated with water they won’t float. Then to work: “We match every log with another of like diameter and hang them off with topes. We bore holes on either side, drive the ropes in and set pegs on top of the ropes, forming batteries and placing them in rafts.” All this –all day – in the rain. Incredibly, some of the men doing work on the logs with Hayes cannot swim. One such, a “genial Pole” named Jack Zientara. fell into the rushing flood and would have perished but for the “nimble feet” and pike of Ed Johnson. A little more self-reflection at his 27th birthday: “My relatives all say I am a failure, and this hurts, for they get every extra cent I make.” His mother says he should have gone to Stanford when offered the chance, but what’s done is done. Hayes will try again for Alaska with Martin this summer – though George Glynn will be mad. The preacher John Walker died. Hayes went to hear him preach in the street then the two talked on about earthly versus heavenly riches until about 10:00. Walker was stricken with an aneurism around midnight and died peacefully the next evening with Hayes standing over him. It is hard to lose “the one sincere friend I had in Eureka. And a letter has come from Martin: “He is to head a considerable party that will fully map the region round Controller Bay, and that he expects to take a trip to the Matanuska region near the head of Cook’s Inlet to investigate the coal beds there.” Martin wants Hayes along and will pay several hundred dollars! With Alaska waiting, time drags on the millpond for Hayes. The local duck hunters refused to allow their traditional hunting ground to be restricted: “Despite the warden resident on the reserve, hunters invaded it from every side. When the warden chased men out on one side, others came over the farther boundary, shooting at every duck, far or near.” Hayes thinks: Bully for them; Alaska has plenty of ducks. 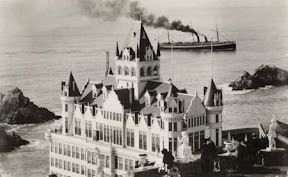 With no remark about what George Glynn said about Hayes leaving the mill in Eureka, Hayes strikes out north for Seattle by way of Marshfield where he saw an old shipmate apparently hiding out and dropped a note to his cousin Edith Carlson, then to Portland where the World’s Fair will open shortly. Seattle still booms on trade to miners heading to the Klondike. A few friends amuse Hayes in Seattle and Martin will be here in two weeks. The photo below is from the 1904 expedition, the trip Hayes missed for want of a razor. GC Martin wears the tall boots on the left. Sailing North to Seattle in ragged clothing and dubbed the ship’s “Jonah,” Hayes learns of the death of his childhood hero, Henry M. Stanley. Perhaps some of the flaws he reads concerning Stanley’s ethical conduct at the Battle of Shiloh, very near where Hayes father William Morrison grew up, allow Hayes to find some more mature assessments, of both Henry M. Stanley and William M. Perkins. The map below won’t appear in an email. His trip north following the green desert walk shows as the yellow path. Click here to download chapters 1-27 on Google Earth. It is interesting to compare this 1904 hike across the desert with his trai-hopping trip across a similar path in June of 1900 (segment 13.8). In 1904, after his conversion experience at Victor, he chose to walk because he had resolved to stop stealing from the railroad companies. Given his ragged appearance, no one will consider Hayes for a job. He got a haircut, but the shearing didn’t help, and the barber cheated him. Near desperation, he writes, “Today I saw a large gang of men working on the street. It looked worth a try, but on approaching near to them I saw they wore a sort of uniform, and that each was shackled with a chain with a ball attached.” It was a gang of hoboes rounded up for vagrancy. With his appearance, a closer approach might have landed Hayes a job and a ball and chain of his own. Now completely broke, Hayes writes, “I had no food the last day in San Pedro, but was fortuned to find a few half rotten oranges in a dump outside the town.” In 1904 Los Angeles wasn’t its current sprawl so he “hiked the thirteen miles across the sun burned hills to Redondo, and found myself at the end of things.” Meaning, I suppose, no money and no food. The girl’s mother offered Hayes a pitcher of buttermilk – which he drank to the bottom hitting his stomach “as if I had swallowed a cannonball.” Renewed by a hearty meal following the cannonball, Hayes took up a hoe to clean the weeds from half an acre of potatoes. The man of the house paid Hayes 75¢ for hoeing the potatoes and some vegetables, then cleaning all the mustard out of his grain. 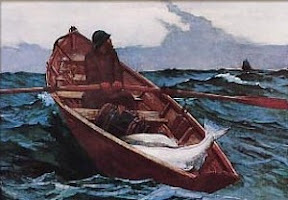 A bitter wind blowing from the Northwest makes the John A. Campbell tack morning and evening in order to sail upwind. Dressed only in the rags left him by the desert, with no oilskins to keep off the weather, Hayes jumps up into the rigging happy for the warmth of vigorous work. At least it isn’t raining. Hayes reports being duly impressed by the advice and very happy with his assignment as cook’s assistant where he’s out of the wind and has plenty to eat. 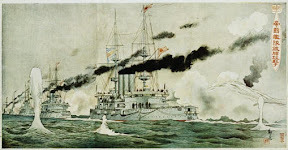 As the wind continues to blow against the ship, Hayes “heard the skipper say he was sorry he let the Salvation Army man come on board.” Worse yet, disregarding the cook’s advice, Hayes walked out on the men in the forecastle when they were telling “salacious stories.” So now the men have named Hayes Jonah of the ship – his cursed presence on board explains for the ceaseless headwind blowing continually stronger as the ship beats its way north. Hayes first went to the employment offices in Seattle, but these charge a fee for placement “and I had none of that.” So he went up to Ballard to some sawmills where “I might as well have tried to break into a bank as get a job there.” A Swedish clan operates the mills, passing the jobs only to sons at the death of their fathers. After sleeping a night in the woods, most of Hayes’ last 15¢ went for bread and bologna. 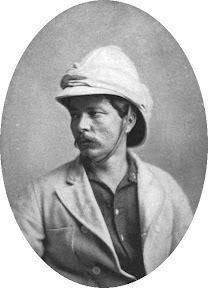 “The other five cents, not being of special worth went for a paper.” This extravagant expense can only have been prompted by the paper’s headline – an announcement of the death of Hayes’ childhood hero, the Welsh adventurer in Africa, Henry M. Stanley. 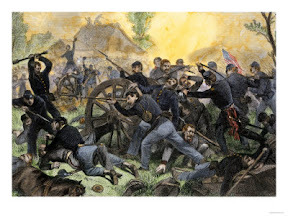 From the paper Hayes learns that his hero Stanley fought at the Battle of Shiloh – in a manner that tarnishes some of Stanley’s luster: “Serving under Beauregard of the southern army, he was captured there. But politics meant nothing to Stanley. Later he joined the northern forces and served until the end of the war. It would seem that a man must have no scruples if he is to win in life’s battles.” Hayes draws this lesson from Stanley – while steadfastly refusing its application to his own life. The work is hard: “We are not driven, … but no slacking can be done.” Hayes and the 15 other men working in the quarry blast rock from a basalt outcropping then crush it by hand swinging massive hammers. “I am sore all the way thru, but the life I have led has hardened me until I can stand it.” A flea-ridden bunkhouse where, “We sleep the sleep of exhaustion,” a woodstove with plenty of wood for warmth, and good food in large quantities at the cookhouse make the place tolerable enough for a wandering man – at least until he can raise a stake. You are currently browsing the Hayes Here and There blog archives for August, 2011.